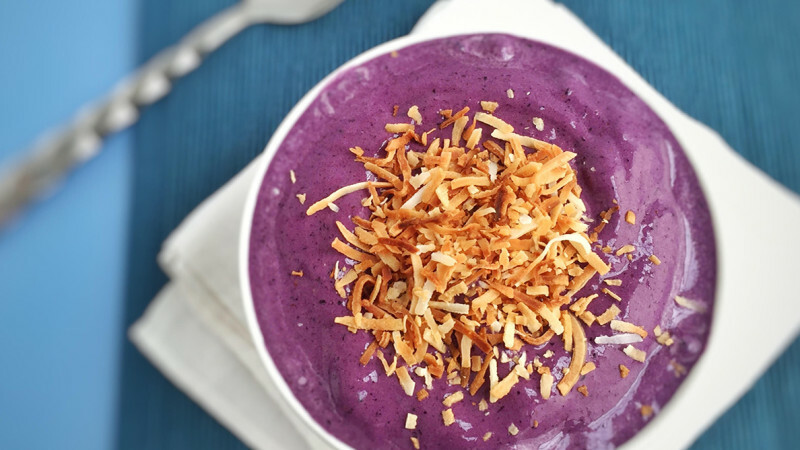 Step 1 Add coconut milk, chia seeds, protein powder, Stevia, coconut flour, blueberries, and ice into a blender, and blend until smooth. You may need to scrape down the sides once or twice during blending. Step 2 Transfer to a serving bowl, and top with toasted coconut. Optional: For an added punch, add 1 tsp of lemon juice and 1/8-1/4 teaspoon of ground ginger. Who says smoothies are only for breakfast? If you’re in a hurry, fruit and seeds combined with protein powder is a great meal to help those sore muscles recover after the gym.